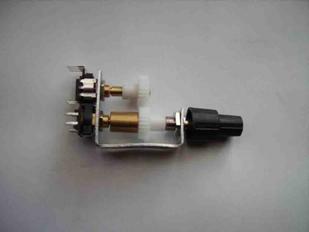 The frequency adjustment controls for the radio equipment are implemented using rotary encoders. In many case there is a requirement for a dual concentric type device, in order that an outer knob can be used for course control and an inner knob can be used for fine control. Incremental rotary encoders provide a pair of out of phase digital signals that allow determination of both the speed and direction of a shafts rotation. The quadrature nature of the two signals contains directional information. The bit 2 bit binary pattern produced will be different depending on the direction of rotation. As can be seen from the 2 bit number sequence, only one bit ever changes at a time. When the encoder is turning CW the pattern will be 01,00,10,11 and when turning CCW the pattern is 01,11,10,00. This sequence is commonly known as Gray Code. 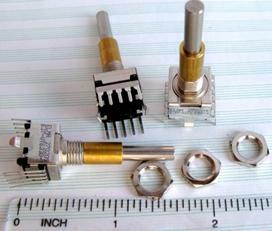 An additional attribute of the rotary encoder is the detent. The detent is a position to which the encoder will settle between rotation steps, for example there may be 16 detents for each 360 degrees of rotation. The electronic interface to the rotary encoder is achieved using the Master Card supplied by OpenCockpits. This interface has the ability to read Gray Type encoders directly BUT there is an additional requirement of this interface, which causes us issues. The clockwise output from the encoder from the above would be 00 at detent 1, 10 at detent 2, 11 at detent 3 and 01 at detent 4.. The clockwise output from the encoder from the above would be 00 at detent 1, 10 at detent 2, 11 at detent 3 and 01 at detent 4. After much research a small dual concentric rotary encoder was found. The devices are manufactured by ELMA as the E37. These encoders will not interface directly to the Master Card. OpenCockpits do supply an interface card which can be used to connect four Gray Type encoders to the Master Card inputs. This interface uses a PIC microcontroller to interface four encoders to the Master Card. On further investigation it was found that it would only work with full cycle per detent type devices. It was decided to try and modify the PIC code to cater for the ½ cycle per detent type. 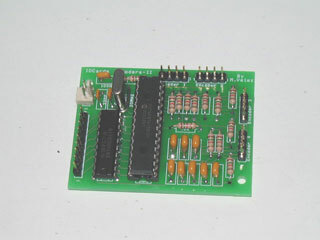 The Encoder II card uses PIC16F876 micro-controller device. The code was downloaded as a HEX file from the PIC using a PIC programmer device, this code was then run through a disassembler to produce a symbolic list file, which was in turn manually annotated and tidied up. 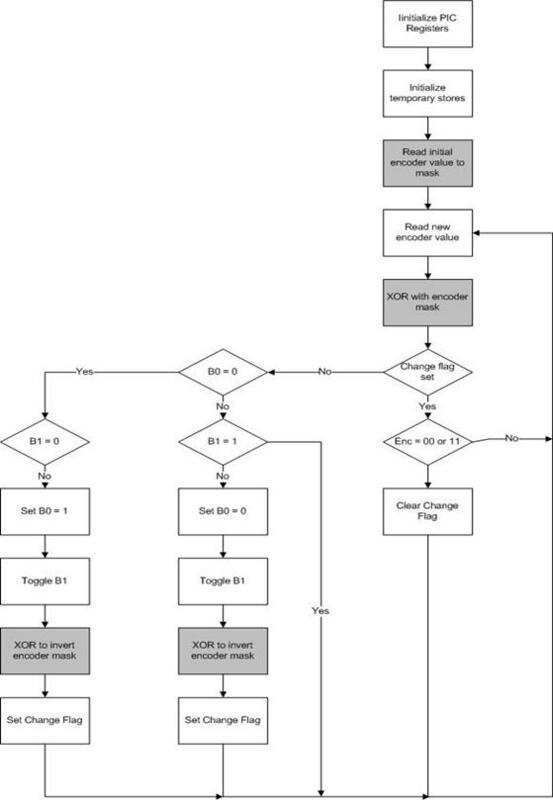 A flow chart was generated from the assembler listing. After either 4 or 5 enter a loop waiting for both encoder outputs to be 0, signifying that the encoder has reached the detent position. Step 6 relies of the encoder being a full cycle per detent type as both encoder outputs are 0 at each detent position. The difference between the full and ½ cycle devices is that for the full type both outputs are 0 at each detent position, while for the ½ cycle device both inputs are alternatively 0 and 1 at each detent position. Hence step 6 above will not work correctly for the ½ cycle per detent device type. Enter a loop waiting for the encoder outputs to change. 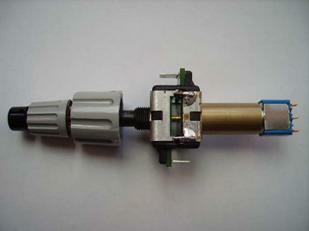 The encoder outputs are XORd with the mask. If the mask is 11 the encoder outputs are inverted, if the mask is 00 the encoder outputs remain unchanged. After either 5 or 6 enter a loop waiting for both encoder outputs to be either 00 or 11 depending on the current mask value, signifying that the encoder has reached the detent position. The ZIP files contains three HEX images, one for a quarter cycle per detent version, one for a half cycle per detent version and one for a full cycle per detent version. They can be copied to the OpenCockpits Encoder II card PIC 16F876 with a suitable PIC programmer.